Email newsletters offer news organisations a chance to maintain a strong direct relationship with readers, a high degree of targeting, better showcasing of existing content and original analysis and commentary.There has been a sharp increase in their production in recent years, both by “legacy” print and newer digital media publishers. The trend mirrors the continued strength of emails in daily life, and their widespread use in marketing, despite the advent of more sophisticated and proprietary digital tools. The development of other platforms and services including shared drives, apps and social media has helped liberate email newsletters for what they do best: provide short, simple, primarily text-based content “pushed” to readers in a way that is easily retrievable and quick to skim. Emails are a halfway house between print and digital. If read online, they permit a smooth “call to action” – triggering high response rates via a simple click to purchase, subscribe, read more or provide extra information. 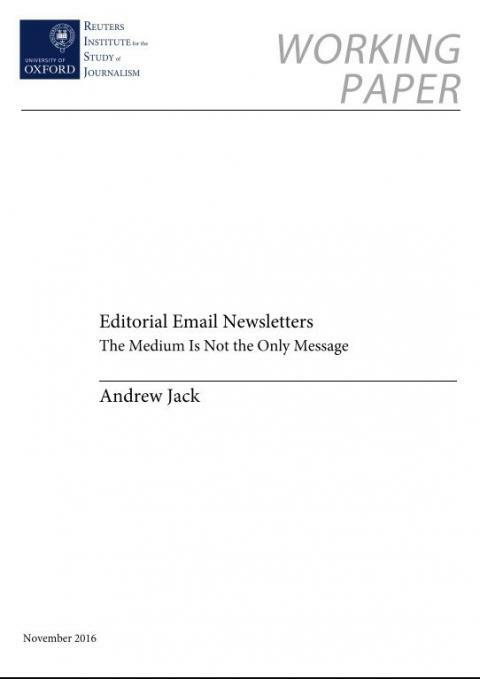 As with newsprint (and apps), emails are generally self-contained, offering a way to read offline on receipt without the need for a phone signal or wifi. That can help provide users with greater, easier and more affordable access when they are roaming, with no connection or in regions with poor bandwidth. One challenge today for email – like so many other aspects of the digital newsroom – is monetisation. Interviews and industry data suggest that targeted emails requested by readers are widely opened, read and often the article links they contain are clicked. Editorial emails can help inform, educate and entertain readers, while boosting brand awareness and readership on and offsite, encouraging subscriptions, maintaining loyalty of existing readers and providing a platform for advertising. The degree of focus on, and the ability to deliver, revenue through the medium varies widely. That raises questions over sustainability, the resources invested and the capacity to sustain momentum given so many competing priorities at a time of increasing commercial pressures. Other significant concerns are falling use by younger people, the risk of user fatigue over time, and the surge in the use of editorial emails which makes it more difficult to remain visible and competitive. While the specific format of email newsletters may go out of fashion, the characteristics that have bolstered the success of the best ones are finding parallels in other forms of journalistic output and will be increasingly valuable: discovery, curation, serendipity and “finishability” in an ever-growing universe of digital content beyond the capacity of any individual to identify or absorb.